In 1908 architect A. S. Hedman completed plans for a power-house to be erected for the Union Railway Company on Brook Avenue north of 165th St., the Bronx, at a cost of $30,000 (Real Estate Record and Builders' Guide, v. 82, no. 2128, 26 December 1908, pg. 1308). In 2015 the building was still standing with the company name inscribed in its pediment, although the Union Railway itself was long gone. 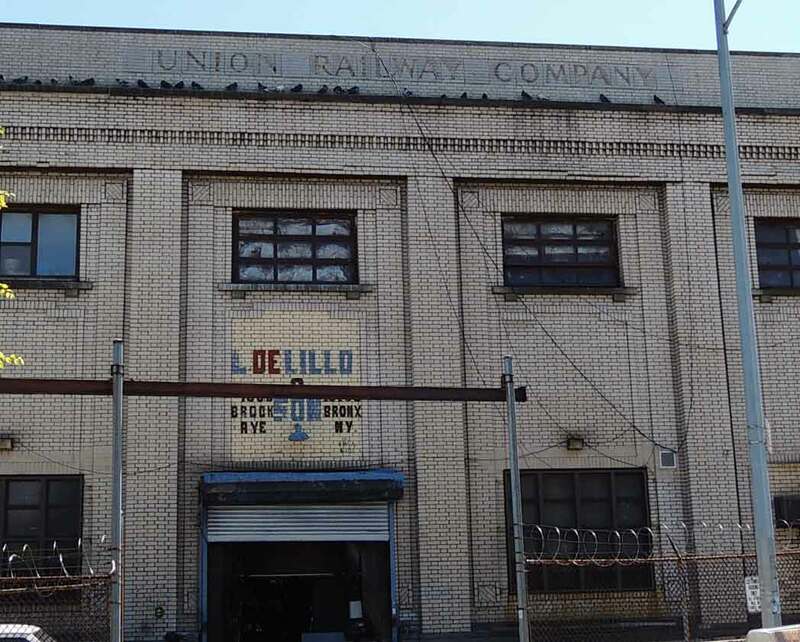 The Union Railway Company was a street railway (trolley) company that operated in the Bronx from 1892 to sometime early in the 1940s. In 1896, however, they lost their independent status and became a subsidiary of the Third Avenue Railway Company, which operated trolley lines in Manhattan and the Bronx. The origins of the Union Railway Company are described in this article from the New York Times, 6 July 1892, pg. 2, "The consolidation of the North Third Avenue and Fleetwood Park Railroad, the Melrose and West Morrisania Railroad, and the Harlem Bridge, Morrisania and Fordham Railway Company was completed yesterday and the agreement was filed in Albany. Nearly all of the stock of the three companies was represented at the meeting of 2,389 Third Avenue and there was no opposition to the consolidation. This is the combination of horse railroads commonly spoken of as "The Huckleberry Road." Its new corporate title is the Union Railway Company of New-York City, and it has $2,000,000 of capital stock, which is more than double the capital stock of the three companies. Following are the names of the Directors elected yesterday: Charles A. Stadler, William Cauldwell, John c. De La Vergne, Thomas W. Olcott, James W. McNamara, and Edward A. Maher of New York; Anthony M. Brady and Robert C. Pruyn of Albany; Albert Shaw of Troy. The executive officers are: President - Edward A. Maher; Vice President - Charles A. Stadler; Secretary and Treasurer - Thomas W. Olcott. About seventeen miles of the Union Railway are now in operation by horse power. It is expected that before the frosts of next November the entire seventeen miles will be operated by the trolley electric system. Eight miles of new road will be constructed without delay, making twenty-five miles of road, (all on the trolley plan.) which will traverse, in many directions, the territory lying between the Harlem River and the Westchester County line. The change to the trolley on the main artery will probably be made before the end of August. ..."
The first president of the Union Railway Company was Edward Augustin Maher (1848-1920). His obituary in the New York Times, 15 Sep. 1920, pg. 9, gives some of the history of the company. "Edward A. Maher, former President of the Third Avenue Railway Company and a pioneer in the electric lighting industry in this country, died suddenly on Monday night at his home, 345 West Eighty-eighth Street. Mr. Maher was elected President of the Board of Supervisors of Albany County when only 22 years of age. He also served as a member of the Assembly and as Mayor of Albany in 1888 and 1889. Mr. Maher was 72 years old. He came to New York in 1890 as President of the Union Railway Company of the Bronx, which was then called the "Huckleberry" line. The Third Avenue Railway in 1896 took over the company and he remained. When the Third Avenue line was taken out of receivership Frederick W. Whitridge was elected President and Mr. Maher Vice President. In 1917, on the death of Mr. Whitridge, Mr. Maher was appointed to succeed him in the Presidency of the company. In 1918 he retired from active life." In 1908 the inability of the Union Railway, and its parent company the Third Avenue Railroad, to pay creditors led to the appointment of a receiver. The receiver was Frederick Wallingford Whitridge (1852-1916). His obituary in the New York Times, 31 Dec. 1916, pg. 16, recounts how Frederick W. Whitridge went from receiver in 1908 to president of the Third Avenue Railroad in 1912, "Frederick Wallingford Whitridge, President of the Third Avenue Railroad Company and its associated companies of the Bronx and Westchester County, died late yesterday morning in the New York Hospital. His death was directly due to heart disease. ... Mr. Whitridge, who became famous for making the Third Avenue system a paying road and whose recent controversy with the labor unions during the car strike brought him into prominence, was in his sixty-fifth year and was born in New Bedford, Mass. He was educated at Amherst College, from which he was graduated in 1874, with the degree of A. B. and at the Columbia University Law School, where he received his degree of Doctor of Laws in 1878. In 1879 Mr. Whitridge was admitted to the bar here and a few years later became head of the firm of Whitridge, Butler & Rice, lawyers, of 59 Wall Street. ... It was not until January, 1908, that he became prominent here. On Jan. 6 of that year Judge Lacombe of the United States Circuit Court practically separated the Third Avenue Railroad from the New York City Railroad Company, and appointed Mr. Whitridge its temporary receiver. Then came one of the most astonishing receiverships railroad men have ever seen. Instead of allowing the property to drift along in the usual manner, Mr. Whitridge dropped practically all his other interests and jumped into harness and ran the road himself. He took charge of every detail of its management, and, true to his character, was absolute master of the system and all its workings. ... Four years after being appointed receiver, in 1912, Mr. Whitridge turned the Third Avenue back to its stockholders as a going proposition, and was elected President of the system. ..."
Also an officer at Union Railway was Thomas Worth Olcott (1856-1938). His obituary in the New York Times, 20 July 1938, pg. 19, read, "Elmsford, N. Y., July 19. - Thomas Worth Olcott, former secretary and treasurer of the Union Railway Company of New York, operating street cars in Westchester County and the Bronx as a part of the Third Avenue Railway System, died here last night in his home at the age of 82. He retired about twenty-five years ago. Mr. Olcott was born in the dwelling at Albany that now is the Govnor's [sic] Mansion. It was the home of his parents, the late Thomas Olcott, president of the Mechanics and Farmers Bank of Albany, and Mrs. Harriet Leonard Olcott. After working for his father's bank for a few years, Mr. Olcott went to New York with the Union Railway Company. He was a life member of the St. Nicholas Society of New York. His widow, Mrs. Eleanor Thatcher Olcott, survives." The Wikipedia article on the Union Railway reads, "The Union Railway Company of New York City (often shortened to Union Railway) was chartered in 1892, and consolidated several streetcar transit franchises across Manhattan and The Bronx in New York City in the late 19th century. The Harlem Bridge, Morisania and Fordham Railway (established in 1863) combined with the North Third Avenue and Fleetwood Park Railway and the Melrose and West Morisania Railroad to form the nucleus of the Union Railway in 1892. All lines were electrified the same year. Union Railway was acquired by Third Avenue Railroad Company in 1898, which later reorganized as the Third Avenue Railway." For more about the Third Avenue Railway see the Third Avenue Ry Co manhole page.